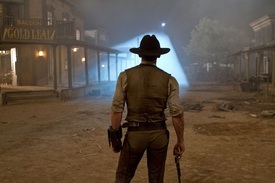 Cowboys & Aliens is a nearly exact description of the conflict at the heart of Jon Favreau's latest film. A better one is Cliché & Exposition. Favreau, working from a script by Robert Orci and Alex Kurtzman (of Transformers: Revenge of the Fallen infamy), has adapted a dubiously popular comic book into a questionably coherent blockbuster which explains its half-baked ideas more than it bothers to develop them. A big question mark lingers over the film's commercial prospects as it faces off against the family-friendly juggernaut The Smurfs and the second week of Captain America, but the film should be a straight shooter in ancillary releases where its idiosyncratic charms can be better appreciated. Daniel Craig plays a fugitive from the law who is mysteriously unable to remember what it is that he did that landed him on the lam. After intervening in a scuffle between snotty drunk Paul Dano and local businessman Sam Rockwell, Craig lands himself in the slammer accused of crimes he committed before his memory wipe—and his major persecutor is Dano's cantankerous dad Harrison Ford, who arrives in town with bail money for his son and claims that Craig stole his property. And then aliens attack from above. After Dano and handful of other townspeople are abducted into the night sky, Ford and Craig strike a tenuous truce to rescue their fellow citizens and identify this bizarre, futuristic menace. All failures have a "fatal flaw," the lynchpin of logic or character design or story structure that when acknowledged cause the whole thing to collapse. Cowboys & Aliens' is twofold: why do the aliens want what they want, and why do they have to bother with humans to get it? The script's answers are just two halfhearted throwaway lines said by same character at almost the same time—the very definition of lazy writing—and neither justifies the central conflict of the film. There's just no good reason why the extraterrestrials want to mess with humans, and the treasure they seek is valuable only because it gives the humans a third-act redemption. Favreau has devoted a lot of time to creating a distinctive ensemble and no energy to giving them something interesting to do. Even with a cast that includes Craig, Ford, Dano, Rockwell, plus tough ingenue Olivia Wilde and Deadwood's Keith Carradine as a sheriff, none of the actors do more than the minimum: providing a conventional emotional arc or supplying vital information when the story demands explanations. And the rhythms of the storytelling offer no dramatic momentum to keep audiences engaged. Orci and Kurtzman's too-smart-by-half script is a compendium of western clichés with far too much self-awareness to be this one-dimensional. It's easy to like the cast—thanks as much to their previous work as anything on screen here—but with such a convoluted, illogical and dull story, no one fares particularly well. As counterparts, Craig and Ford's chief difference is the proportion between good and bad in their souls, but the script's ham-fisted revelations makes them less—not more—complex as the film goes on. Both are too busy evoking western iconography to elicit real sympathy or emotional investment. Adam Beach, Hollywood's go-to Native American, has sad eyes that effectively hint at the humanity Ford's character hides away. Still, he has almost nothing to do for himself and is only by a matter of degrees the most sophisticated Native American character in a field of textbook noble mystics. Sam Rockwell is rudderless as a feckless businessman forced to embrace his masculinity, but at least he's not Olivia Wilde who's given the unenviable (and unplayable) chore of existing only to provide expository information during the film's second half. Favreau's cool efficiency lends the whole project less personality than its high concept needs. But ultimately to blame for Cowboys & Aliens' overall ineffectiveness is Orci and Kurtzman's script. The duo is skilled at creating emotional punchlines and then undermining them with storytelling choices that ignore logic or narrative continuity. Craig's initial amnesia, for example, provides an initial air of mystery, but its explanation has no emotional weight, raises more questions than it answers and softens the impact of what should be a triumphant conclusion to a tragic story. From the title alone there's hope that Cowboys & Aliens is unusual and fresh, but in truth it's just mundane. Half as weird as it should be, it's painfully terrestrial.